Alta Lightweight Crank Pulleys MINI - Pann Auto Performance - San Diego largest aftermarket automotive performance parts - What do you drive? The MINI has always been plagued with laggy throttle response. One of the major reasons is the massive amount of weight hanging off either side of the crankshaft. The flywheel / clutch is abnormally heavy as well as the crank pulley. One easy way to remove some of that weight is the installation of an ALTA Lightened Crank Pulley (LCP)! Plus on supercharged models, we offer a 2% overdrive model that increases boost too! Read more below! 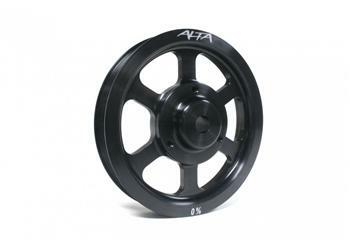 The ALTA LCP is engineered to increase horsepower and torque. The 0% Stock Sized pulley is a lighter rendering of the stock crank pulley which will not wear out engine bearings or the oil pump, and will not add any additional vibration or noise. The 2% Over-sized has all the same features of the 0% Stock Sized pulley but adds more boost to your car (on Supercharged Cooper S models only.) By simply increasing the diameter of the pulley boost is increased, safely and reliably. Unlike some aftermarket pulleys which are underdriven and prone to charging and drivability problems, the ALTA Performance lightened crank pulley will have no effect on your cars charging system. Made from 6061T6 aluminum and weighing in at just .65 lbs,the ALTA pulley is more then 2.3lbs lighter then the stock crank pulley. The reduction in weight is effectively the same power increase as removing 60 pounds of weight from your vehicle. Also, the OEM pulley is a two piece design. While that may be a great place for MINI to save some $$ on manufacturing costs, it has plagued the MINI owner ever sense. The OEM pulley will come apart and as such wipes out the belt tensioner and leaves you stranded. When you upgrade to an ALTA LCP, those issues are eliminated! The ALTA LCP comes in two sizes. 0% and +2% over-sized. The +2% overdrive effectively shrinks your supercharger pulley size by the same amount. A 15% supercharger pulley will act like a 17%. A 17% pulley will act like a 19%. This also increase the amount of belt contact with the pulleys. Saving the belt and decreasing wear.